Valentine’s Day is almost here! Before we let loose with cards, flowers and candy, maybe we can take a little time to think about love since that’s what this day is supposed to be about. I recently read All About Love: New Visions by bell hooks. I’m glad I did. The author, an eminent teacher, writer and lecturer, points to a problem I’d never considered: We are confused about love. And this confusion, according to hooks, leads to our having great difficulty, as a society, in loving one another. As I think about it, I notice this confusion in our use of the same word in “I love you,” “I love chocolate” and “I love your dress.” Maybe it’s just lazy speech. But even if we avoid lazy speech, most of us are still hard pressed to articulate what we mean when we speak of love, and we seldom agree. Perhaps that’s why love so often disappoints us. This differs from more common definitions emphasizing romantic love or the single ingredient of affection. In Peck’s definition, hooks explains, love involves both intention and action. Whether or not his definition fully resonates with you (I realize the word “spiritual” has baggage), you might agree that action should be important. Love is as love does, or it isn’t really love at all. If love requires action, hooks points out, then it cannot coexist with behaviors that contradict it like abuse, neglect, cheating and lying. This applies to relationships with children as well as with other adults. Think how pervasive these behaviors are in our culture. All too often we hear or read of people who insist they love someone even as they hurt or disrespect them. Within Peck’s definition is another important concept: Love involves choice. Rather than fall in love or find ourselves in love, we choose to love. Our choice makes us responsible, accountable for the love we claim to give ourselves or others. That’s a powerful idea. We should not expect to receive the love from others that we do not give ourselves, hooks cautions us. Self-love is necessary and should not be equated with self-centeredness and selfishness. It often has to do with overcoming low self-esteem and increasing self-acceptance, she points out. Maybe we should all give ourselves a valentine this year to remind us that we too are worthy of our love. I hope this glimpse into a complex subject gives you some food for thought on Valentine’s Day, some inspiration to make your own love, of yourself and others, the best it can be. Speaking of food . . . 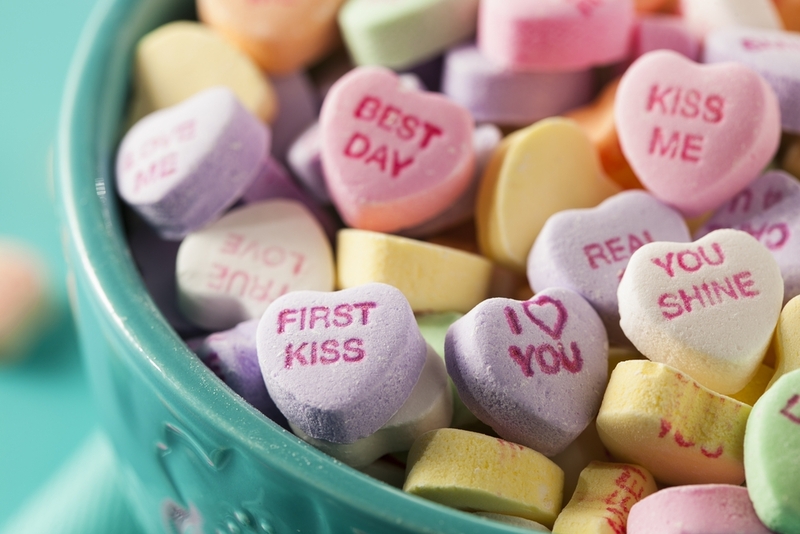 I just read that Necco shut down last summer, so I will have to get by without the Sweethearts conversation hearts I’ve always loved – I mean, liked.